Welcome to Happy Bird Music Studio! Happy Bird Music Studio provides a positive atmosphere for creative learning. Students of all ages love Nicole's easy-going, yet structured approach. Nicole believes that music is a valuable tool for expression and is accessible for everyone, no matter what their age, goals or time commitments for practising may be. 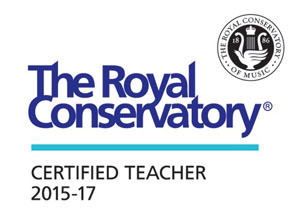 Nicole C Bowers is a RCM Certified Teacher. Current students, sign in (below) for details on scheduling and invoicing.